I found this recipe in a cookbook my mother in law gave me and knew immediately I had to try it! 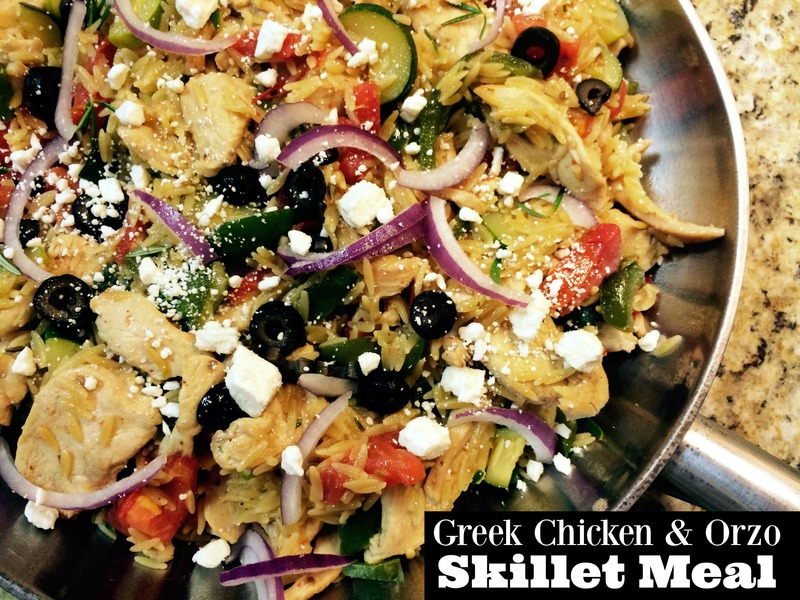 I love everything in it (especially the feta cheese!) and the fact that it is made in 1 skillet, is just icing on the cake! This was SO delicious and the leftovers were even better the next day. Heat a large skillet (one that has a lid) over medium high heat. Add chicken and cook for 5 minutes. Add bell pepper and zucchini and cook for 5 minutes more. The last minute, reduce to medium and add the garlic, stirring constantly to keep garlic from burning. Add chicken broth, water, and uncooked orzo. Heat to boiling. Reduce heat, cover and simmer for 8 minutes, stirring occasionally to keep from sticking. Stir in tomatoes, rosemary and cover and simmer for 5 minutes more, continue stirring occasionally. Top with red onion, black olives and lots of feta cheese.